Sharing an enjoyable, local adventure with a friend always makes for a great day. Add in great food, handmade candy and wheelchair accessibility – and you’ve got a winner. But what if tell you that you can find all of this at and around Joe Ley Antiques in downtown Louisville? Before I lose you at “antiques,” I need to say that Joe Ley Antiques is not your average antique store. 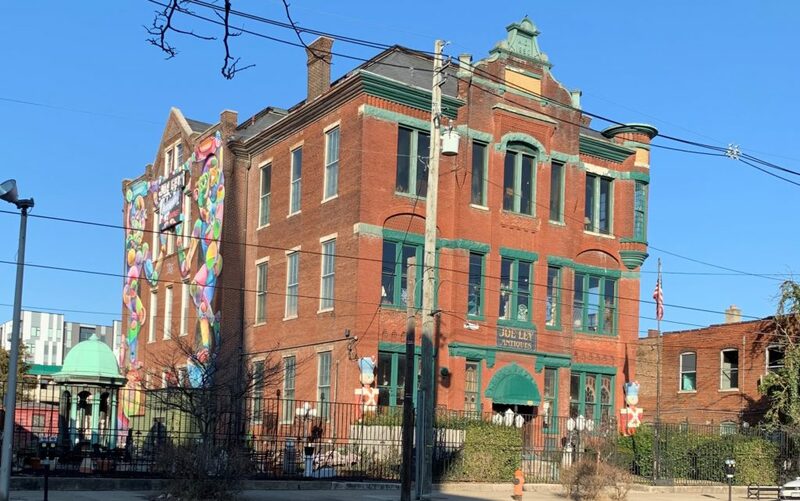 It’s housed in a building that was originally a schoolhouse built in 1890. It’s part museum, part amusement park. Joe Ley’s is the largest single-owner antique store in the US. The various antiques lend to the museum feel. 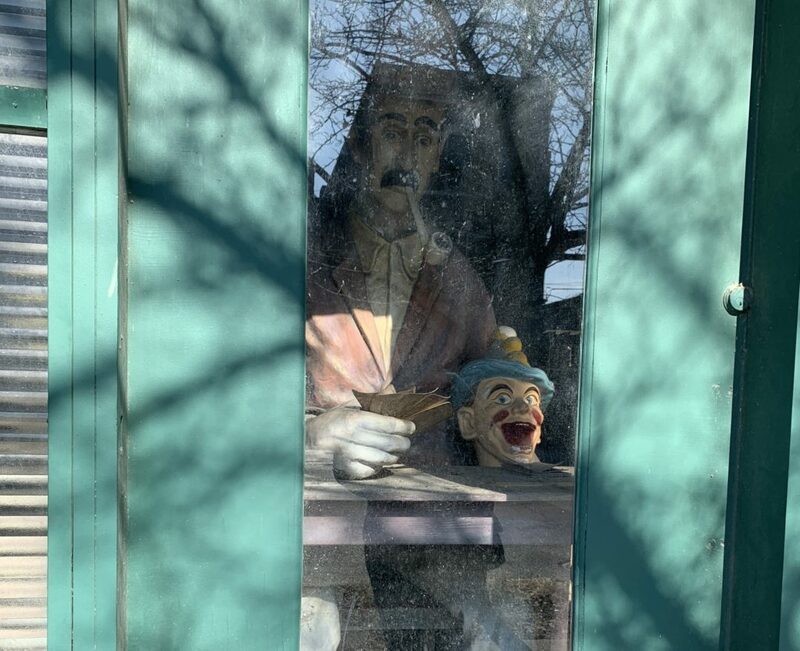 But throughout the building are a smattering of mannequins, dolls, marble or cement statues and vintage carnival paraphernalia that, when all combined together, give this place an other-worldly atmosphere. My first time to Joe Ley Antiques started off a bit rocky. Years ago I parked my van and crossed Market Street, only to find five steps leading up into the 19th century building. Grabbing my cell phone, I called the number I found online. After I explained I used a wheelchair and asked if they had another entrance, I was told to head a bit further down the street and they’d let me in at the warehouse entrance. Now when I go, I know to call when I arrive and someone will let me in. After calling to announce our arrival, Beth (my history-loving, Jane Austen Festival-attending friend) and I walked down to what looks like an unconnected building that is the “warehouse.” As we looked at a “man” seated at a table in a window, we heard the green metal rolling door going up while a friendly employee greeted us. When arriving at the warehouse entrance, a few items might need to be moved. But once you get inside, collections of antique doors, fireplace mantels and cast iron Victorian firebacks greet the eye. The aisles are doable in a chair. ADA compliant? No. But it’s better than your average shopping store. 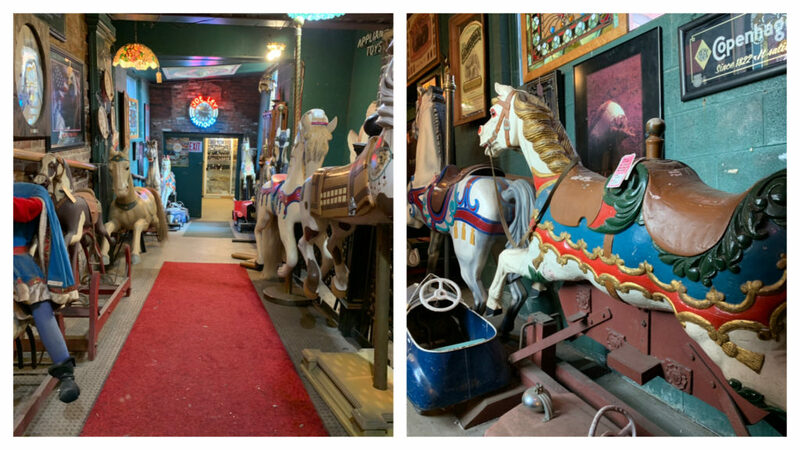 After exploring the warehouse (and finding the hidden-in-plain-sight mannequins, statues, clowns and other oddities), it’s time to head up the ramp, which is lined on either side by horses that once went round-and-round on Fontaine Ferry’s carousel. In the main building, there are three stories of antiques, collectibles and items for the eye to feast on. Some pieces are breathtaking. As are some of the prices. Others are simply humorous and quirky. I often find myself wondering who owned these pieces and what stories they could tell. The unexpected is found in the middle of the first floor of this 1890s-era building: A freight elevator going to each floor. The staff assists me if I’m by myself. But on our joint venture a few weeks ago, Beth was shown how to operate the elevator. And after a rocky start, we were exploring the second and third floors. When I’m on my own, the staff has given me a walkie-talkie (or I just use my cell phone) to call when I’m ready to go from one floor to the next. The other nice surprise: A bathroom I can get into. It’s not perfect, but even in my power chair I had enough room. The door has an antique knob (no lever handle), so I asked Beth to stand outside the bathroom door to hear me knock if I couldn’t turn the knob. Each floor is a maze and I often have to retrace my steps. At times there are a few places too close for comfort, so I’ll go the long way around – or simply not go down a too-narrow passage. But overall, I can get around with a bit of care. As we went into one of the many rooms on the first floor of the main building, we came across Joe Ley himself. I couldn’t help it. I had to ask. Joy Ley Antiques is at 615 E. Market Street in Louisville, Kentucky. The store is open Wednesday through Saturday 10am to 5pm. If you are looking for something specific, expect to ask for help. 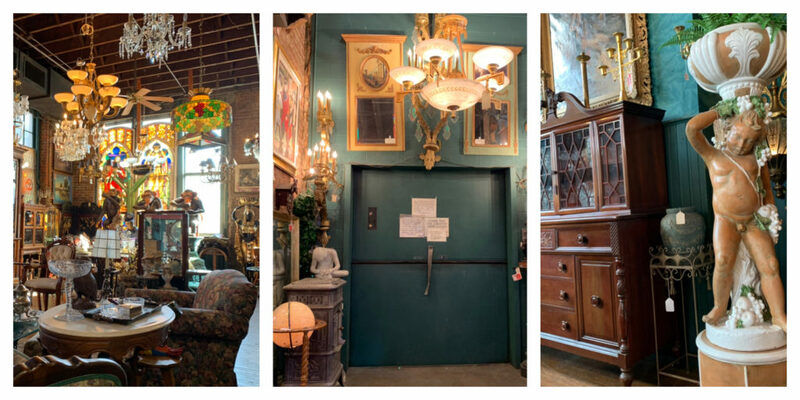 With hundreds of door knobs, antique hinges and other architectural items, it’s hard to know where to look. When I was looking for a wall mount for a set of Victorian cast iron wall sconces I had purchased, an employee took me right to one. I’d never have found it! If you’re disturbed by mannequins or clowns, well, expect to be creeped out. It’s fun seeing a policeman unexpectedly seated at a dining table. It’ll make you look twice. Don’t expect to see price tags. The store uses an interesting pricing system that needs a small piece of paper to decode the price. Get the “decoder” on the first floor of the main building.